I started working on the wiki. Yue – High flatlands between Black River and the northern coast, dominated by animal husbandry including sheep and goats. Horses are popular and horse archery is a common sport. The people are fierce and tend to respect only those who have earned admiration through athletic skill, particularly on the horse. Yangchen – Flat plains between the Black River and Siege River, dominated by wheat and barley farms. This region is considered one of the two agricultural bases of the Jin Empire. Horses are popular here, from the Yue region to the west. The people are quiet and humble. Han – Hilly region along western half of Black River. Recent leveling of the land to increase mass agriculture has led to regular mass flooding, with the historically rapidly moving Black River expanding out into a wide, slow river. The flooding has led to mass emigration from the area, though mining is still clinging to the area. The remaining villages tend to be desperate and hardened. Hu – Lightly wooded area along White River and the marshlands of Still Lake. Trade is impossible along the rapids here, but many of the farmers in this area raise temperate fruit trees. Silk production is a major industry and source of wealth here. The people tend to be superstitious and alchemy is prized. Loku – Relatively wealthy area centered on Gusing. The people tend to be highly religious, focusing on worship of the emperor and the imperial family, and highly patriotic, and they lead relatively regimented lives. Even the farmers tend to live in stable family structures, causing class and wealth to become entrenched. Wan – Heavily forested and hilly region at the western end of the Black River. Human villages settle at the edges of the forest and at the foot of the mountains, particularly on the river. The lumber from this region is highly valued for specialized crafts. Humans also mine for iron, gold, and bronze in the mountains. Humans do not enter the inner forest on foot willingly, as it is considered by haunted by the superstitious and simply dangerous by everyone else. Zhao – Hilly region between Black and Gold Rivers. Human settlements have traditionally clustered around valley lakes, with a few herders in the hills, but more villages have moved out of valleys to cluster around mines and quarries. Conflicts are rising between the hill and the valley villages. Liao – This flat eastern coast features many fishing villages. Though quiet usually, the villages often feature ritualistic great whale or shark hunts where the young are promoted to adulthood and the old seek death. Jewelry artisans are surprisingly popular here, perhaps drawn by the pearl trade. Ong – Mountainous region around Ceonling. Mainly poor goatherds and farmers clustered around the monasteries that are common to the area. The people here tend to be highly spiritual and devotional but without allegiance to major shen, focusing on ancestral spirits and spirits of nature. Oshi – River basin around Soenglau, with a strong agricultural base centered on rice. The people from this area are known as hardy and strong. Even among the poor, meat is not rare at the dinner table, most often featuring water fowl but also beef and pig. This is one of the rare areas where cow’s milk is drunk. Guola – Coastal region around Toisam, with clear class divisions as one approaches Toisam and the land becomes more elevated. The clifftop aristocratic class literally lives above the poor fishing villages. Middle class is artisanal and bureaucratic class rather than traders. Sichi – Subtropical southwest region of the Jin Empire, fed by waters from both the Sichi River and the extensive river system of the Itsara. Agriculture is more focused on fruit trees, with limited lumber activity. 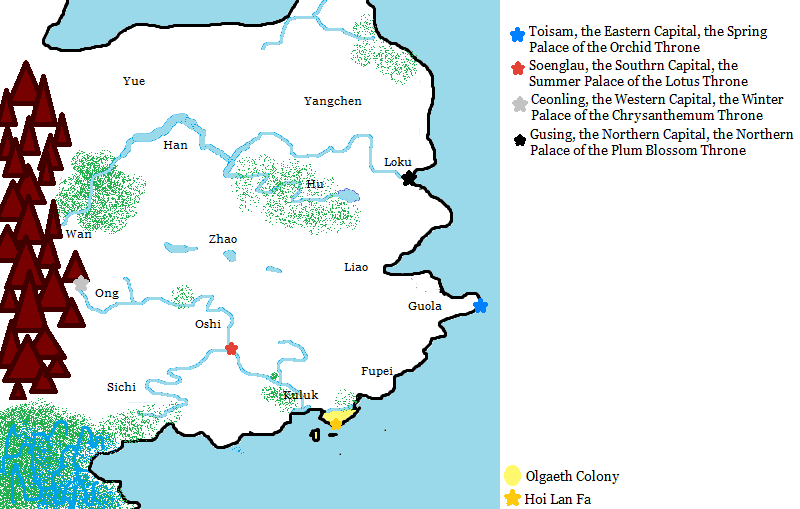 Elven goods enter the Jin Empire through this region and half-elves are not uncommon. The people are lighthearted and independent. Kuluk – Flood plains and river delta region around the southern end of Gam River where it enters South Sea. Gamkong is the largest city in this area, resting at the mouth of the river. It was a heavy trading and fishing region, with many living in boat homes or stilt homes in marshy areas, though the area has suffered recently from war with the Olgaeth Republic. Music is popular and lively. Fupei – The southeast coast features many high cliffs and hidden harbors and cave systems, making it the traditional home of pirates, who prey on the southern ports. The common people are herders and fishers. The people here are known for their independence and rebellious tendencies.